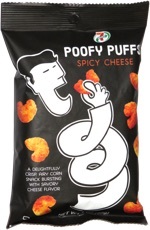 Taste test: These chips are very crisp, but the barbecue flavor is really bland. It's not hot, it's not sweet, and it's really not very tasty. It's just a weak paprika taste. Don't let the red powder on the chips fool you into think there's lots of barbecue flavor on these. 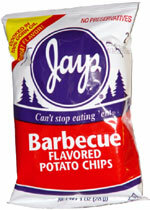 I usually like barbecue chips, but when it comes to these, I'd rather just have some plain potato chips. Smell test: Sharp barbecue aroma, heavy on the parika.